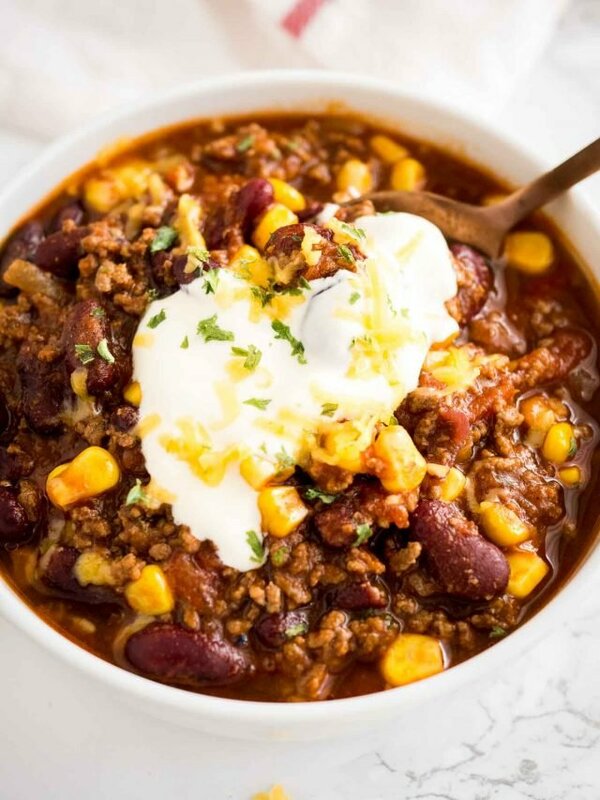 Instant Pot Chili is so easy and quick to make! This pressure cooker chili with canned beans warms up any occasion, from Game Day parties to family meals. Cooking chili at high pressure makes it so flavorful and is the quickest way to get dinner on the table! We love cooking soups and chilis in the Pressure Cooker! The cooking time is a lot shorter but the flavor is a lot more intense and deeper in my opinion. 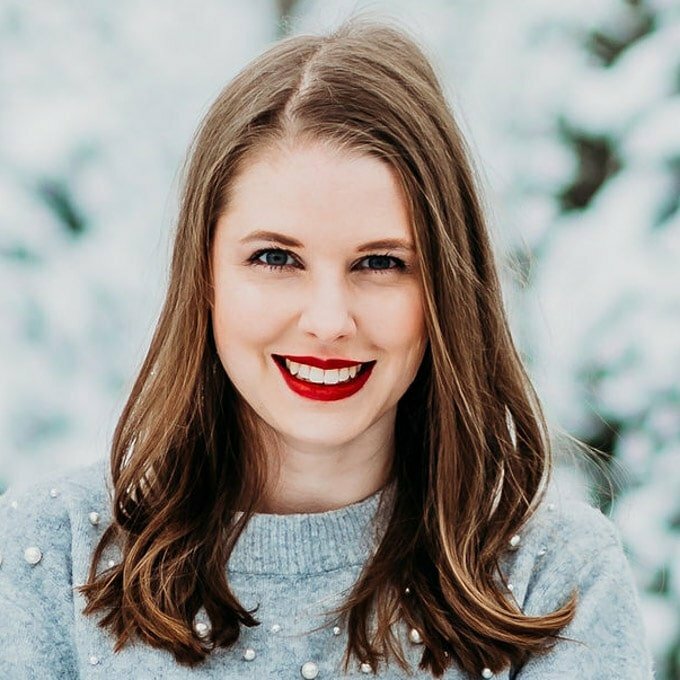 A few of our favorites are Instant Pot Chicken Chili, Instant Pot Lentil Soup with Vegetables, and Instant Pot Carrot Soup Recipe. 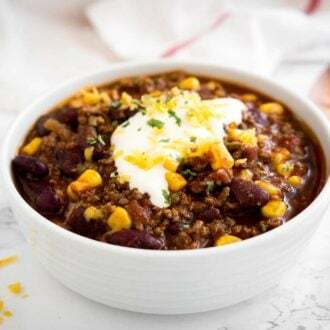 Instant pot chili with canned beans and ground beef is so easy and fast to make! Making it in an electric pressure cooker instead of on the stove saves you time and keeps your kitchen clean. Every time I made chili on the stove our whole kitchen was covered with red sprinkles. Ok, this could totally be my fault because cooking always ends in a bit of a mess when I’m in charge but making chili in my Instant Pot saves me so much time cleaning. For me, it’s definitely worth the investment. Cooking chili in the Pressure Cooker also deepens the flavor and makes chili taste even more amazing, similar to cooking low and slow for hours. If you are a fan of comforting dinners with a lot of flavour that don’t take a lot of effort you need to make this recipe! 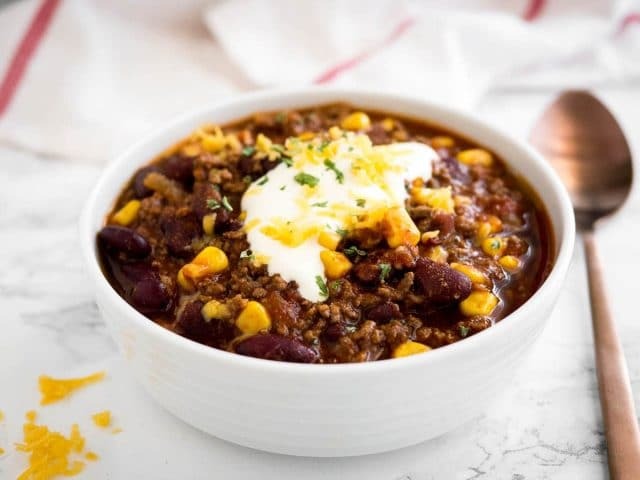 This chili recipe uses individual spices instead of chili mix and develops delicious deep flavors while cooking at high pressure. It’s so delicious that I don’t think we’ll ever go back to our normal stovetop chili! Adding a little bit of cocoa powder is one of the secrets for making a great, flavorful chili. The chili won’t taste like hot chocolate but the cocoa really enhances the meat flavor. I also always add sweet corn to my chili, this might not be traditional but I love the texture it adds. The corn adds a little bit of sweetness and by adding it after the cooking time is over it’s slightly crisp and not soft like the beans. But it’s totally optional! You could add another 14 oz can of beans if you don’t want to add the corn. Reduce or increase the amount of chili powder depending on your taste! Instead of beef broth, you can also use chicken broth or vegetable broth. Instead of chopped tomatoes, you can also use crushed tomatoes. IMPORTANT: North American Chili powder is very different from what you can buy in Europe. The European kind is a lot more spicey so you have to reduce the amount to about 2 tsp. 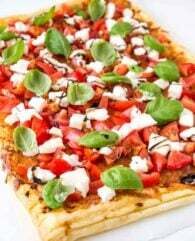 Layering the tomatoes on top will help to not get the burn error. The newer Instant Pot models tend to get this error more often. My favorite toppings for Chili are Sour Cream, Shredded Cheddar Cheese, Cilantro and sometimes avocado slices. For a big crowd, I like to set up a topping bar so everyone can top their chili with their favorite toppings. 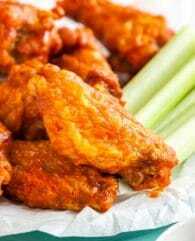 Perfect for game day parties! is so much easier to handle! When I first got it I was overwhelmed by all the buttons and didn’t know what I should do with it. But after trying a few recipes I feel quite confident and love cooking with it. 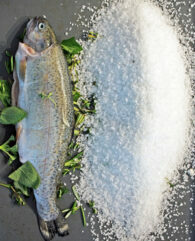 It’s great for basics like cooking rice or potatoes. Making mashed potatoes is super easy and quick. But I also made pulled pork in it and it was the most tender and juicy pulled pork we’ve ever eaten. My husband couldn’t get enough! 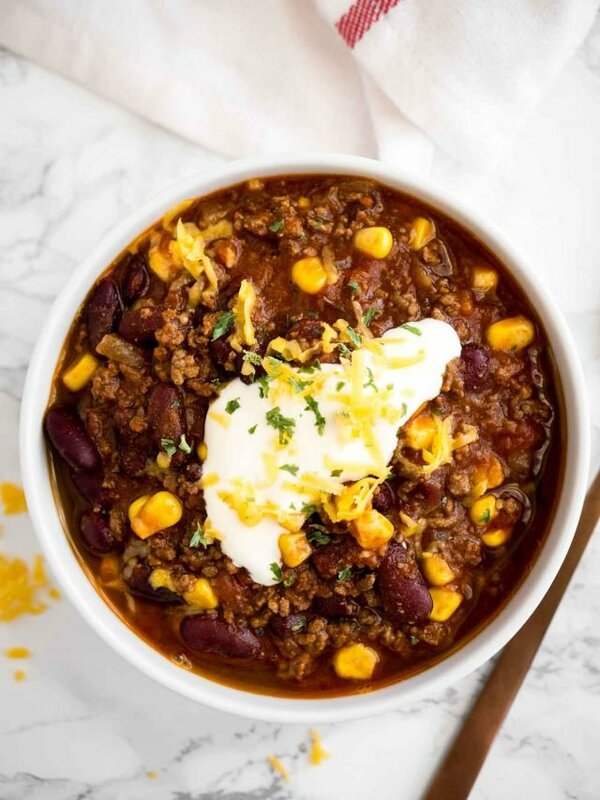 This Instant Pot Chili is no exception! It’s so good and flavorful! I usually serve this chili with a dollop of sour cream and some shredded cheese on top! My Cheesy Pumpkin Dinner Rolls or some cornbread also make a great side. One thing I always had problems with were the kidney beans in my normal chili. Even so, I always use canned beans instead of dried beans it seemed like they weren’t cooked long enough and my belly started to rumble after eating chili. But cooking them at high pressure works like magic! I don’t have problems anymore. YAY! This is my go-to unsweetened cocoa powder that I use for all my baking and cooking! Their chocolate chips are also great. This is the model I use and love. The size is perfect for a family of 4. This tool makes separating ground meat so easy! 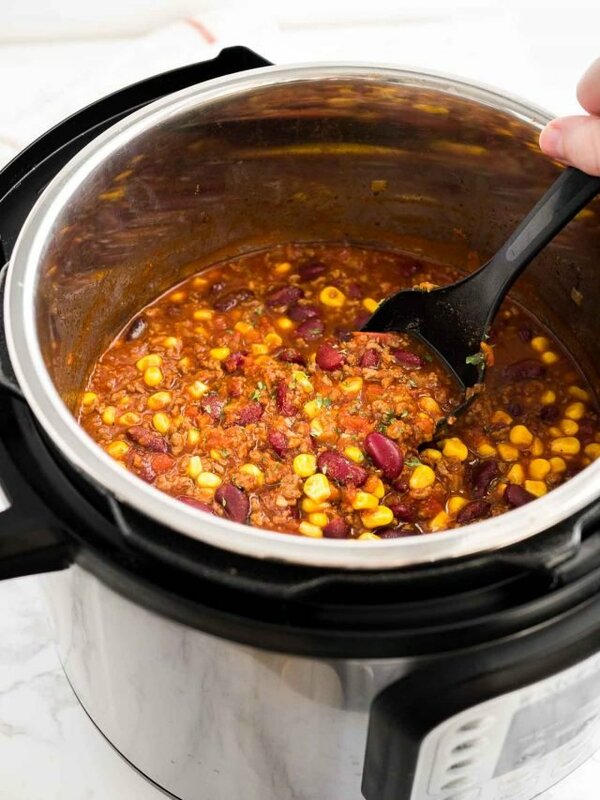 Want to try this Pressure Cooker Chili recipe? 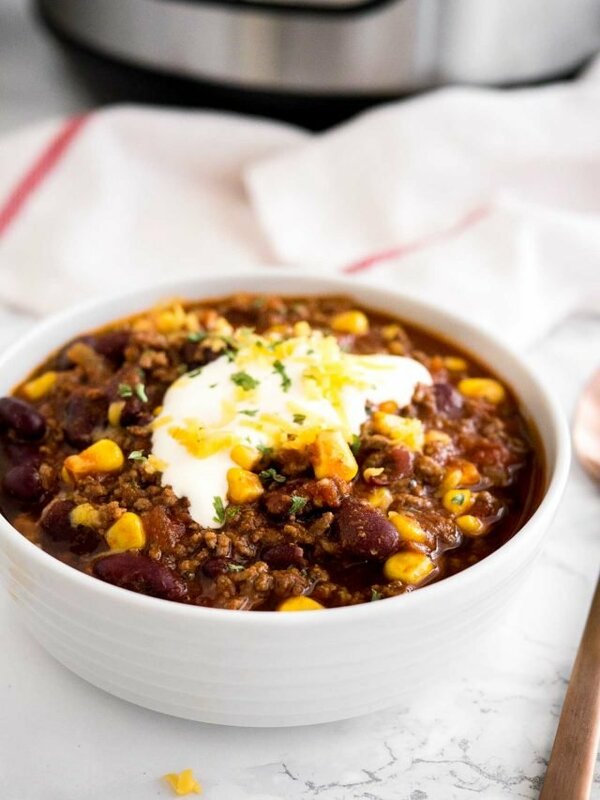 A delicious Instant Pot Chili that is so easy to make! Watch the VIDEO below to see how easy it is to make! Press saute button (adjust to less if your Instant Pot runs hot). When the Instant Pot is hot add oil and diced onions. Saute onions for about 3-4 minutes until lightly browned. Add minced garlic and saute for 30 more seconds. Add ground beef, chili powder, ground cumin, and oregano. Break up the meat into small pieces and saute until browned, about 4 minutes. 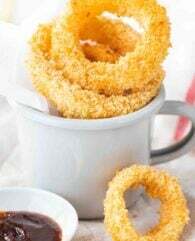 In a small bowl combine beef broth, tomato paste, and unsweetened cocoa powder until dissolved. Pour mixture into the Instant Pot to deglaze the pot. Use a spatula to scrape the bottom of the pot. Add beans and stir until everything is combined. Then add tomatoes on top but don't stir. Layering the ingredients prevents getting the burn error. Cover and cook for 10 minutes at high pressure. Natural release for 10 minutes and then quick release the remaining pressure. Remove the lid and stir until everything is combined. If you want to add corn: Press the Saute button and add the sweet corn. Let simmer for a few more minutes until the corn is cooked through. 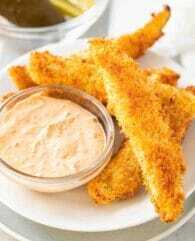 Season to taste with salt and black pepper and serve topped with sour cream and cheese. Recipe originally published January 2017. Updated with recipe video and improved instructions. I have no cocoa powder. What can i use to substitute or can i just leave it out? A little piece of dark chocolate works too but you can also just leave it out. Did you change this recipe in the last month? I know I’ve used chipotle chili power and 1 tsp of unsweetened cocoa powder instead of 2. Also 3/4 cup of chicken stock – not 1 cup of beef broth. I’ve only ever had one chili recipe saved, and this is it. Am I crazy? You’re are definitely NOT crazy! I’m sorry for the confusion. I modified the recipe a little bit a few weeks ago. The only changes were the ones you mentioned, so feel free to use chicken stock, less cocoa, and add a bit of chipotle chili powder. I still make this recipe at least 2 times per month for my family and wanted to incorporate the little changes that I started to make. I feel like beef broth is a better fit with the ground beef and most of the time I don’t have chipotle chili powder at home so I increased the amount of chili powder. Sorry again! I hope you still enjoy the chili! No worries at all. Just thought I was losing it! Lol. I made it from the new recipe, and it didn’t taste the same. Great recipe regardless! I used one chopped poblano pepper, sautéd with onion. One boullion cube with water for stock, homemade cooked dried kidney beans, and left out the corn. 2nd time making and it was a huge hit! Thank you! 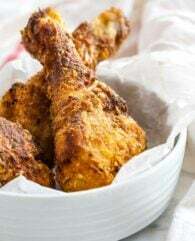 Been making this recipe for months now and it’s always a HUGE hit. We hate beans, so I use mushrooms instead. Even my kids eat this, won’t be needing another chili recipe anytime soon. Excellent recipe that can be easily modified for a slow cooker! Made my very first chili ever and family called to tell me it was “off the charts!” I found it a little spicey as it cooked and so tripled the tomato paste and heavier on the sour cream and grated cheese topping. I’ll be saving and sharing this recipe! Amazing! My son made it and I didn’t have to do a thing! LOVED this chili. I added chipotle peppers in adobe sauce instead and did not put in corn. My husband and friend loved it too! YOU USED THE CHIPOLTLE PEPPERS INSTEAD IN ADOBE INSTEAD OF THE POWDERED ADOBE CHILI? HOW MUCH DID YOU USE? I am wanting to serve this for company. When you say it makes 4 servings, is that larger servings. I will be feeding 4 adults and 3 kids. I was thinking about 1.5 times the recipe. If I read the above reply correctly you do not need to adjust the cooking time, is that correct. Thanks. We loved this; I had some frozen corn from last summer I added 1 can dark kidney, 1 can black beans-both low sodium and added a little more tomato paste at the end to thicken it up. Served it with cornbread. Definitely will make it again. This is the best quickest easiest chili out there! We have multiple food allergies so I omit the beans and it still tastes amazing and we can all eat it! Thanks for sharing this recipe! What changes if you double the recipe.? I love chili but I use Italian sausage meat instead of hamburger. That sounds so delicious, Jim! I love Italian sausage. Next time I make chili I have to try this!